It's 626 tradition to always have the biggest baddest event in May. Expect nothing less than PURE awesome for our 2013 May Mayhem! Drift practice, exhibition, tandem, multicar MAYHEM! Drivers $95 via paypal, $90 in person with cash. Passenger $5 via paypal or person (please send the full name of the passenger along with the payment). DAY 2 HAS BEEN CANCELED DUE TO A CONFLICT IN SCHEDULE. New announcement! Our friends at Tire Central is paying for your track event! For every 2 tires you purchase including installation, they will pay $10 of your track! If you don't know Tire Central, they offer the BEST PRICE and BEST SERVICE for tire service in the SGV/626. Don't believe me? Check out their Yelp page, Solid 5 stars with over 238 reviews! http://www.yelp.com/biz/tire-central-san-gabriel Give them a call today, ask for Donald or Alan. Tell them you want the 626Drift Discount! Save $10 on your entry fee for the ENTIRE 2013 season! Only $85! Garage life is specialized in Rotary engines, Mazda, Nissan, Honda, Toyota, and most imports and domestic cars. They carry most brand name tires and tire mounting service is available! If you need any fabrication, welding, or body work done, Garage life is also a specialist in those fields. So come down to Garage Life, they want to take care of you and your car. Save $10 on your entry for every $100 spent on service, save up to $90 for $900 spent on service(free event!). Save $10 for $150+ spent on parts! You can stack your deals with each promo. 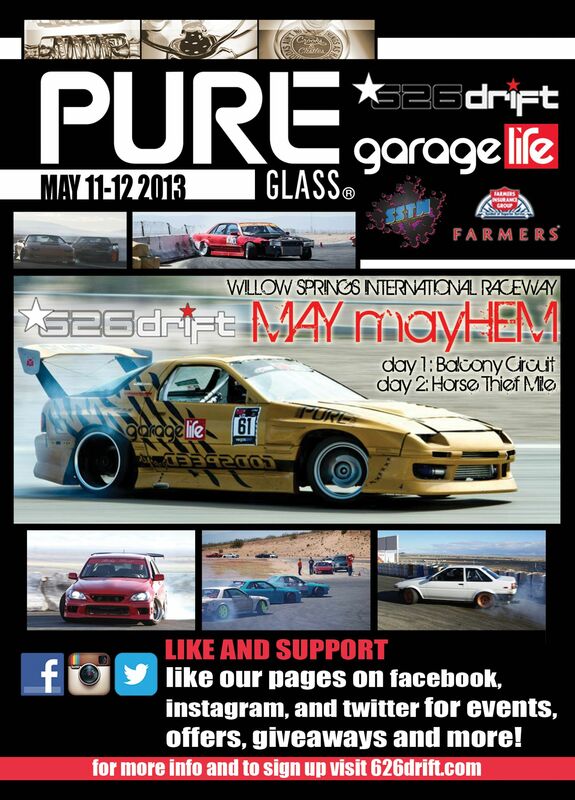 Big thanks to our sponsor Pure Glass for the support. They will be bring pretty ladies out to hand out awards and raffles at the event. Make sure you go follow them on Facebook and Instagram to win prizes. 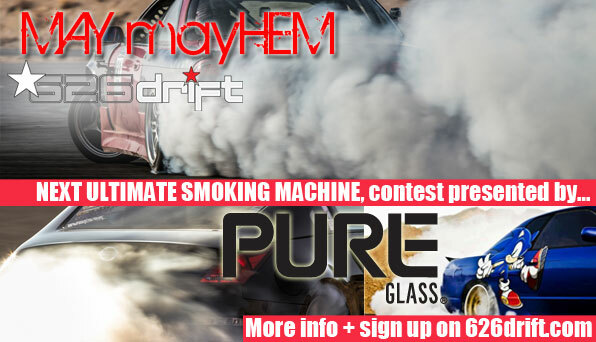 NEXT ULTIMATE SMOKING MACHINE Contest presented by by pure glass. 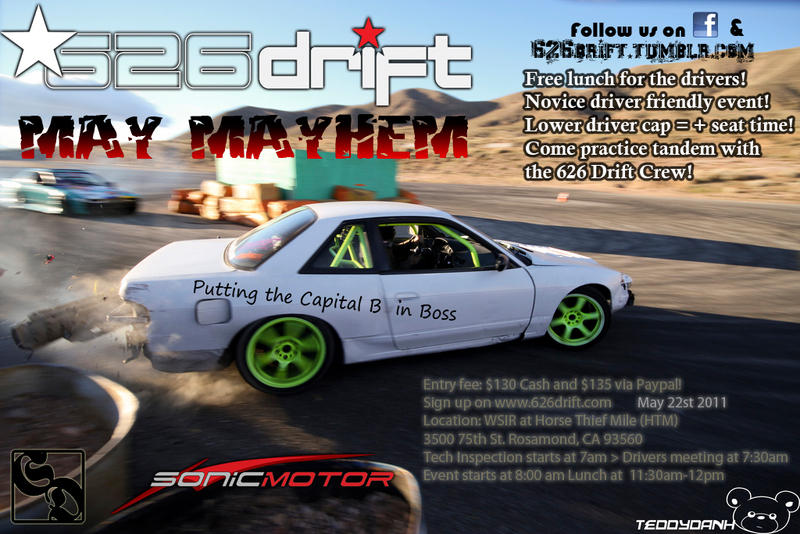 Come join us for some drift action, the driver with the best SMOKE throughout the day gets a Pure Glass WATER PIPE. To participate, sign up for the event and come have some fun on the track. SmokeScreen Treadwear is giving out T-shirt at the event, make sure to like them on Facebook and come to the event! To win, you must be a fan of Smokescreen Treadware, and you must come to the 626Drift May Mayhem event to claim your prize!